I LOVE the new MA newsletter! So much more colorful, with creative use of graphics, photos and type.. very inviting to the reader. The content is still superb as well. Great job to the creative team!!! Thank you RELIV!! Just another tool for us to use to tell the RELIV story! I can keep RELIV on my customers minds using this. I find it very pretty, but I’d like to receive it in print. The internet is too slow for me. I have satelite in the sticks here. keep a print version as not everyone is on the computer. Based on the comments above there might be some confusion. I just wanted to clarify that the print version of the MA newsletter has not been discontinued, nor are there any plans to discontinue the print version. 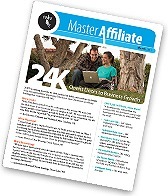 You should still be receiving this if you are a qualified Master Affiliate. We have simply improved the publication to serve you better. We have also added pieces of the MA to the Business Builders Blog as well. We hope you enjoy the additions here.